Many communities in New Jersey are facing problems from flooding whether or not they are along the coast. The New Jersey Department of Environmental Protection’s Coastal Management Office developed an online questionnaire for any New Jersey municipality to use called Getting To Resilience (GTR). 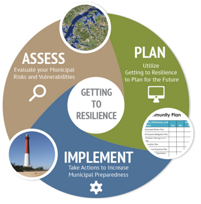 The purpose of this tool is to assist municipal and county officials to reduce their vulnerability and increase preparedness by linking planning, mitigation, and adaptation. The questionnaire consists of five sections: Risk and Vulnerability Assessments, Public Engagement, Planning Integration, Disaster Preparedness and Recovery, and Hazard Mitigation Implementation. The website, http://www.prepareyourcommunitynj.org/, allows users to create an account that other municipal officials can log into in order to share the ability to go through the questions and allow those most informed about each topic to answer. Typically, staff from the Jacques Cousteau National Estuarine Research Reserve (JCNERR) meet with municipal officials and staff to walk them through the questionnaire. In addition to hosting the questionnaire, the website has many other resources that Rutgers students and faculty may find helpful, like outcome reports from municipalities that went through the questionnaire. Lisa Auermuller, the Watershed Coordinator for JCNERR presented this tool during the Resilience Panel at the 2016 RU On the Raritan Conference to highlight the work that JCNERR had done with NJDEP and many other organizations including the Edward J. Bloustein School and the Rutgers Climate Institute. GTR has been used to evaluate over 40 New Jersey municipalities including New Brunswick and Perth Amboy. Representatives from Rutgers, the City of New Brunswick, and Middlesex County participated in the GTR questionnaire process. The GTR New Brunswick recommendations report addresses the risk of flooding along the Raritan River. Recommendation results include better community outreach, buyout and acquisition programs, erosion and sea-level rise mapping and data collection, and the creation of a specific municipal plan. Contact Lisa Auermuller at auermull@marine.rutgers.edu for more information.